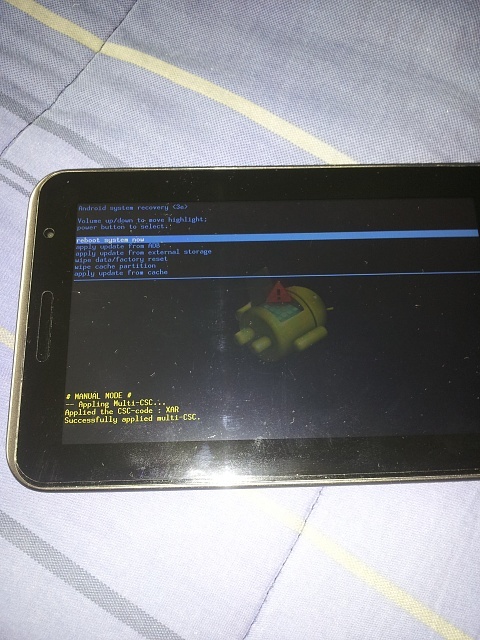 [Guide] Rebooting into Recovery Mode for the Galaxy S2, S3, and Tab2. This is your guide as to how to reboot into Recovery. I have noticed many users do not know how to do this, so I figured I would write a step by step guide with photos on how to do it. I will be using my Tab 2 as a demonstration unit, and for screen shots as visual aids. Step 1: Power down the device. Pulling the battery will work as well, especially if you are caught in a boot loop. Step 2: Allow the device to completely shut down. Waiting until your screen is off, or just giving it a full minute or two should suffice. Step 3a: For the Galaxy S2 and Tab 2, you will need to hold Volume Up and Power at the same time until you see the Samsung logo appear. Then release. 3b: For the Galaxy S3, you will need to hold the volume up, home, and power button at the same time until you see the Samsung logo, and then release. Step 4: For all variants mentioned, you should now be looking at a menu list with a blue highlighted bar. Using the volume rockers will navigate through the menus, and generally power is your accept button. The S2 might have a little twist. Upon getting into recovery, you can push up, down, up to enable the back button. This also allows to use the power button as the accept button. See figure 1. Important note: When navigating around in recovery and you select something, you may be redirected to a page with about a dozen answers. Almost all will be no with yes buried in the middle. This is to prevent accidental accepting of an option. 4b: To actually have you use this guide, you can clear your phone's cache. See figure 2. There are many cache clearing programs on Play, and while they may clear the cache as well as rebooting into recovery, this is merely an alternate method. Click power to accept. Step 5: When completed, you can navigate back, or usually after completing any action in Recovery, Reboot Now will be highlighted at the root menu. See figure 3. This is your gate back to running Android through the User Interface. Click power to accept. Congratulations! You have successfully entered, navigated, executed a command and rebooted all in Recovery. This is also a method to flash a ROM through a .zip file on an SD card, and a complete Factory Reset can be accomplished in this manner as well. Paul627g, wlpdroid, markbc and 21 others like this. Thanks to user Travis Gubernick, this has also been tested and confirmed to work on the Verizon Galaxy Note 2. Golfdriver97 and Jennifer Stough like this. I have been trying to reboot my samsung galaxy grand duos GT 19082 using this procedure (the phone actually shutdown and came back with this prompt) but the reboot system now command does not work. After showing the model number on the screen and a wait, the phone comes back to the reboot menu. What is the next step? I just had to do this because I had a boot freeze. I unfrozen it by connecting to a computer but most of my apps didn't work right or were no longer installed and trying to reinstall resulted in an unknown error during the installing phase. Really hate the fact that I lost all SMS and call logs so I have installed an SMS and call log backup. Also totally hate the fact that my latest Nova layout wasn't backed up (my fault) so I am having to spend time getting everything back the way I like it. I'm not sure about that model. As the first post says, this procedure is known to work on the S2 and S3. What other options appear in the recovery menu? If nothing else works, you might try a battery pull while on the recovery menu. I would suggest to find a stock recovery download and flash that to your device. It may be possible something is wrong on the OS. What app did you use for your SMS and call log backup? But I'd recommend using the Kies software on your PC - it does Contacts, pictures/videos, SMS/MMS, Call Logs, system settings, etc. You'll be hard pressed to find something that does MMS, and Kies is easy to use once you get the drivers set up. On top of that, you can use it to reload the firmware on your phone should the need arise. I use SMS Backup +. Only works if you have IMAP enabled in Gmail. I tried doing this because it felt like my battery was draining much quicker than before after an update (that was the advice given here, and it seemed like it might be applicable). It said "Erasing" before coming up with an "Error" message and then rebooting into normal use mode. It still feels like the battery is draining faster than normal. Do you know of something that could be wrong? If I had to guess, it may be an error in the recovery. If you are up for it, you can try flashing the stock recovery. You should try booting into Recovery mode again and clearing the cache. If you still get an error then I'd suggest performing a Factory Reset, particularly if you haven't done one since receiving an OTA update. Be sure to back up any important information - you can use the Kies software on your PC to backup your contacts, SMS/MMS, call logs, pictures/videos, etc. 9/28/13 Galaxy Tab2 10.1 updated it’s operating system I’m guessing to 4.2? It looked different, now won’t connect to internet, seems stuck in a boot loop. I read about these problems on this forum and tried to go through the steps to reboot into Recovery to clear the cache. I held the power button and up volume button til the Samsung logo appeared and released. And...opps! I must have done something wrong because I came to a screen that I ‘think’ said warning if I wanted to install/change the OS, push down volume to continue, up button to cancel....well I pushed down button thinking I would get to the recovery mode and now my tab is stuck with a screen that reads in red ODIN MODE, white PRODUCT NAME:GT-P5113, CUSTOM BINARY: NO, CURRANT BINARY: SAMSUNG_OFFICIAL. In the center of the screen is a large android symbol below it says: Downloading... Do not turn off target!!! Please where do I go from here? 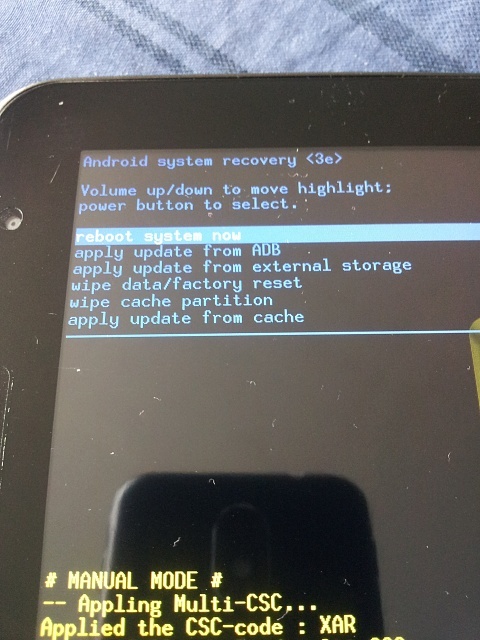 9/28/13 Galaxy Tab2 10.1 updated its operating system Im guessing to 4.2? It looked different, now wont connect to internet, seems stuck in a boot loop. And...opps! I must have done something wrong because I came to a screen that I think said warning if I wanted to install/change the OS, push down volume to continue, up button to cancel....well I pushed down button thinking I would get to the recovery mode and now my tab is stuck with a screen that reads in red ODIN MODE, white PRODUCT NAME:GT-P5113, CUSTOM BINARY: NO, CURRANT BINARY: SAMSUNG_OFFICIAL. In the center of the screen is a large android symbol below it says: Downloading... Do not turn off target!!! Press and hold the power button. You accidentally went into download mode. Press volume up to go into recovery. If it's anything like the S3 you'll have to remove the battery to get it out of Download mode. a) is the "power button" the one on the RHS of the phone? Just checking because It does other things than simply turn on/off power. Stop at the first Samsung logo. Follow directions above, and stop there. Isn't there a Galaxy S2 forum? That would be a much more appropriate place for your post - I honestly have no idea what the Recovery mode steps are on that phone - they may be the same, or they may be different. Regarding the buttons to push, I found that I needed to press the power and volume DOWN to enter recovery mode. Power and volume UP got me into ODIN mode as mentioned above. When it did the ODIN mode download, I just plugged it in overnight and let it do it's thing. By morning, it completed whatever it was downloading and rebooted the tablet. When I did the recovery mode, and wiped the cache, it worked for a second or two, then said error with a dead Android robot icon. It then rebooted. The heading of this thread implied that it applied to S2s as well, that is why I posted here. Will look for the S2 forum. Power + volume down just seems to briefly flash the "Samsung Galaxy SII GT-I9100" logo then revert to the charging icon. I think the battery is dying. I've ordered a new one. When I created this guide it was using the Sprint variants of the S2 and S3. I am sure the procedure is the same for all variants. You are probably correct that the battery needs to be replaced. Typically volume UP is for recovery, and DOWN is for download or ODIN mode. Not saying yours doesn't act this way, but all the Samsung devices I have tried UP takes you to recovery. 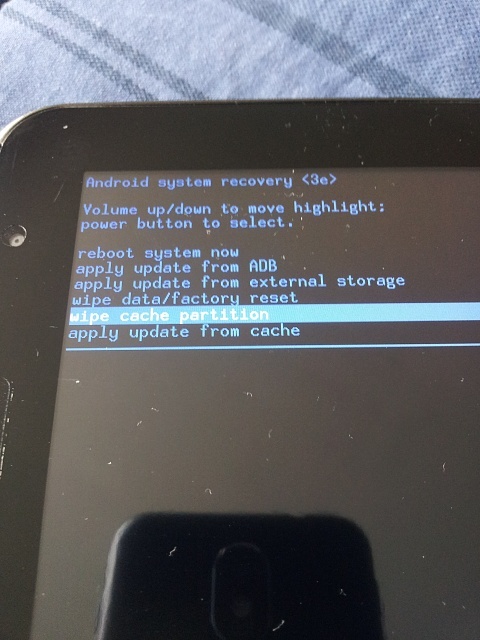 Nexus S keeps rebooting, can't get into recovery mode.